Follow Windermere’s new Pinterest Page! I'm so grateful to all who take a quick minute to "like" my facebook business page (facebook.com/juliebillett), and encourage you to also connect with Windermere's new Pinterest page. As a managing broker with Windermere, I love knowing where I can see pictures of homes and design styles that my clients like and dream about owning. Real estate is such a visual business — Pinterest is an ideal way to connect people to their favorite home features. If you're new to P interest, it's as simple as going to www.pinterest.com to sign up. Pinterest is a pinboard-style social photo sharing website that allows you to create and manage theme-based picture collections. You can browse the collections, called pinboards, and "re-pin" images you like to your pinboard. 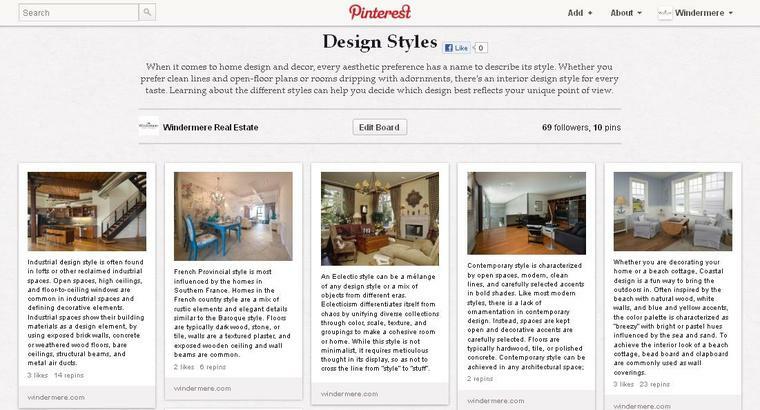 It's both fun and productive to follow Windermere's pinboard at www.pinterest.com/WindermereRE where you can find and collect pictures that capture the look of your ideal future home! It's an epidemic. More than 66% of us suffer from nomophobia, and the numbers are on the rise. In fact, it's up 53% from just four years ago, according to a report released this summer. Nomopho bia is the fear of being separated from your phone. It's an abbreviation for "no-mobile-phone phobia." While the word "phobia" may be a bit strong, as reports do say the majority of phone-related cases are normal anxiety, I can attest to the feelings of panic that attack me when I can't find my phone. The study also found that people check their phone an average of 34 times a day — I'm likely to check mine that many times before lunch! So whether or not being with your phone at all times is an obsession that occupies your every waking minute, as the study says, there's no doubt that phones play a huge part in our everyday lives. 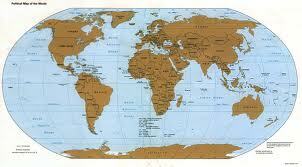 I keep mine handy to conduct business, keep in touch with everyone, map directions, the list goes on. You're always welcome to call or text me — I confess that my phone is always with me! Being unable to pop to the bathroom without taking your phone in with you. Summer is here, and we're all looking for money-smart vacation ideas. The "home-exchange" is just that! You can leverage your own home to cut the cost of accommodations, which is typically the most expensive part of a vacation. Click this link to Windermere's blog to read how a home exchange can help you afford a vacation of your dreams, plus give you the opportunity to "live like the locals." Our homes really are one of the smartest investments we make! One More Reason to Love Woodinville! Every day I'm reminded of why I love living in Woodinville, and what a great place it's been to raise our family — especially when I hear the news about heat waves across the country. But along with our beautiful weather and great outdoors, it's the community spirit that's made it feel like home, living on Hollywood Hill the past 22 years. 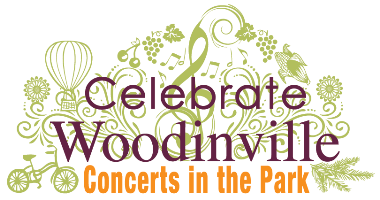 One of those community events is Celebrate Woodinville's Summer Concerts in the Park series, which kicks off this Wednesday night at 7pm with Carrie Clark and the Lonesome Lovers. It's a free evening of family-friendly music at Wilmot Gateway Park, set to take place the next four Wednesdays. You can pack a picnic or buy dinner from a variety of local restaurants that will be set up there, and also enjoy a wine garden hosted by Woodinville Wine Country wineries. We definitely do have reason to celebrate Woodinville…it's a great place to live! Teamwork to Bring in Food Donations! Teaming up with my son Sam, just home from college, and my Windermere team to help ensure that kids don't go hungry was a great way to kick off summer! Last Friday, June 15, we joined on Windermere's Community Service Day to help put dinner on the table for some of the 16,000 school-aged children in our community who may not have it now that school, and their free or reduced-lunch program, is out for the summer. Together we collected, sorted and organized food and donated it to Hopelink's food bank that's located right by our Windermere Kirkland N.E. office. We all had a great day lending a helping hand!